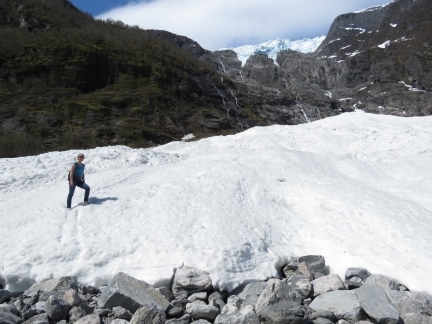 Jostedalsbreen, at 188 sq miles (486 sq km), is the largest icecap in mainland Europe. The icecap extends close to Fjærland at the head of Fjærlandsfjord, a northerly arm of Sognefjord, Norway’s longest fjord. 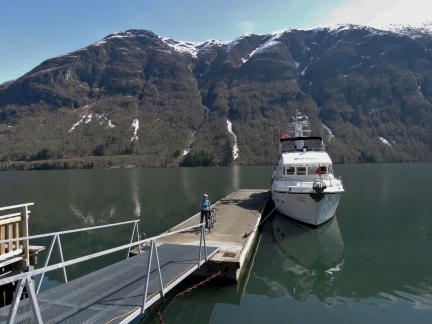 From the guest dock at Fjærland we made an easy bike trip to Jostedalsbreen at Supphellebreen Glacier. On the way back to town, we stoppped in at the excellent Norwegian Glacier Museum to learn more about Jostedalsbreen and the area. A last look at Flåm as we depart for Fjærland. The weather is wonderfully calm and clear today. 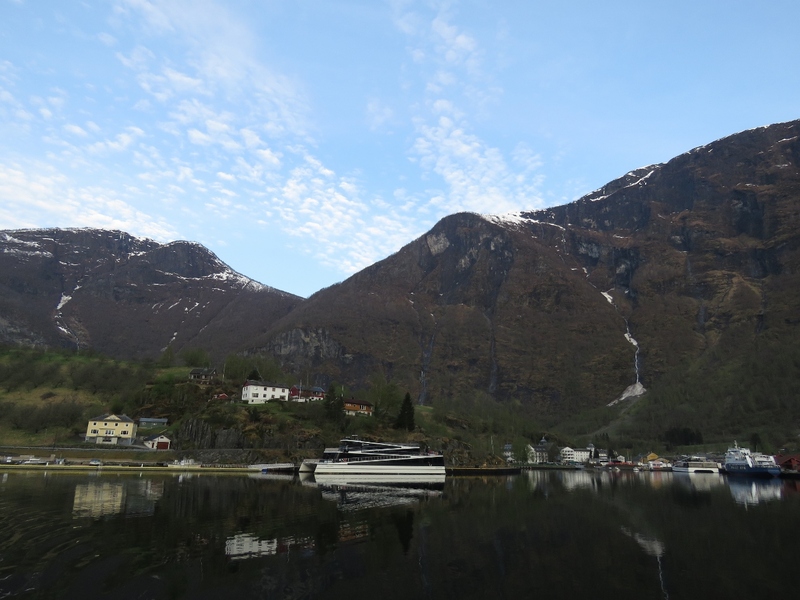 We thought we’d arrived in Flåm before the cruise ship season, but a some have already been here and two will arrive today. 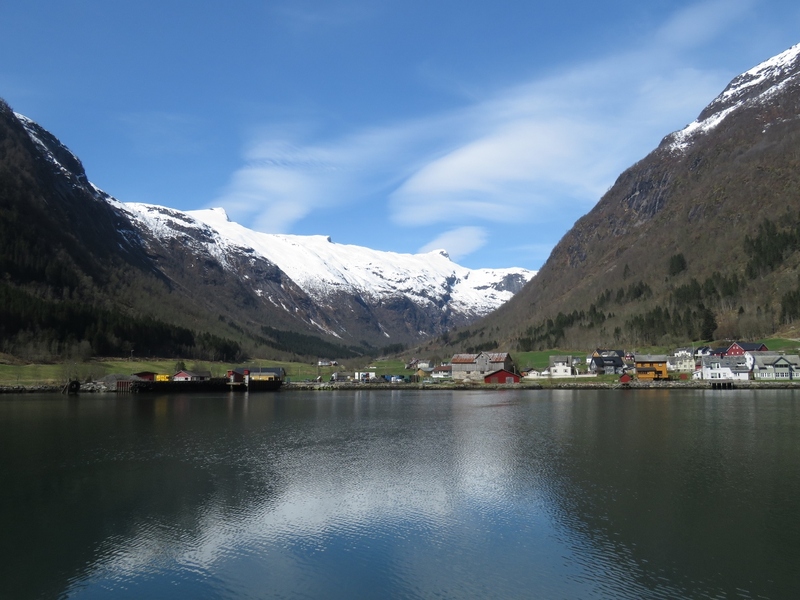 Although it would have been fun to see the cruise ship docked at tiny Flåm, we’re glad to have missed the crowds. 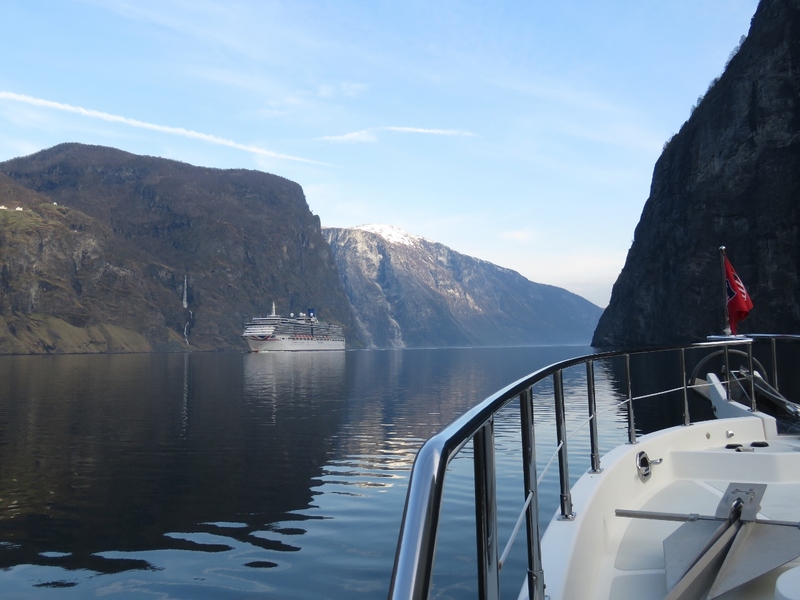 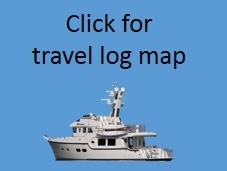 The 950ft (290m) Arcadia can carry up to 2,388 passengers. 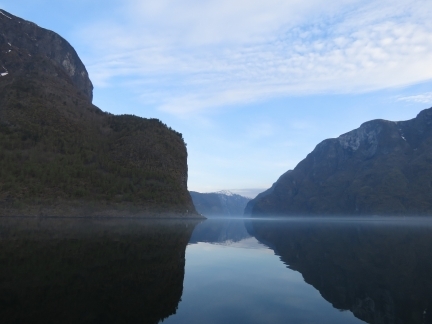 These ships are one of the few things not dwarfed by the surrounding scenery. Snow-covered mountains at the end of Esefjord as we turn north into Fjærlandsfjord. The calm weather continues as we head up Fjærlandsfjord with the mountains reflected almost perfectly in the water. 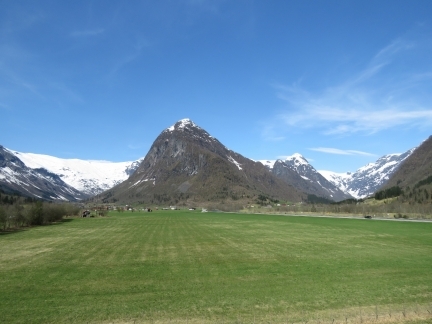 The village of Fjærland at the head of Fjærlandsfjord. Once tied off at the Fjærland quay, we immediately got the bikes down to ride up to Supphellebreen glacier. Fjærland is an International Book Town with ten second-hand bookstores in various buildings throughout town. 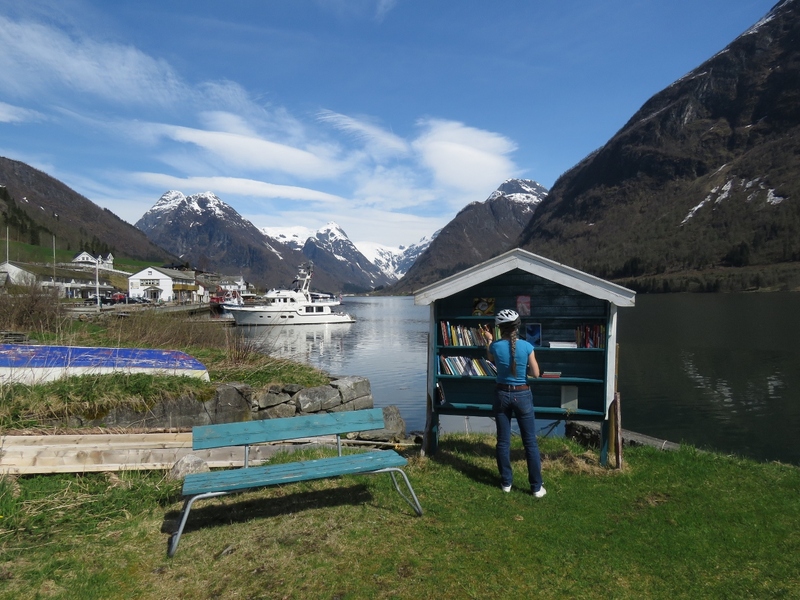 Here Jennifer is browsing the selection at one near our dock. 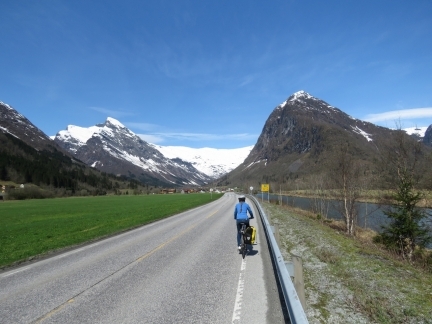 Biking along Riksvei 5 (national road 5) en route to Supphellebreen glacier. 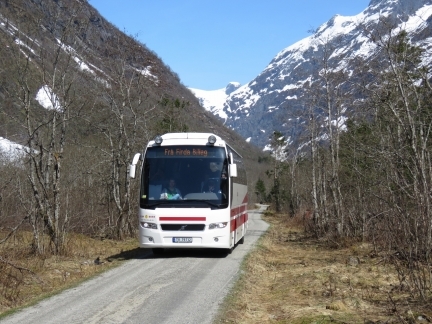 Supphellebreen glacier and nearby Bøyabreen glacier are popular tourist draws. A tour bus was departing as we approached. 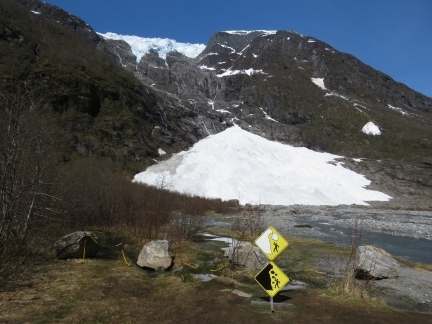 At the base of Supphellebreen glacier. The glacier itself is at the top of the cliff and the big pile of snow below is from ice that has calved off. The yellow signs warn of falling rock and ice. 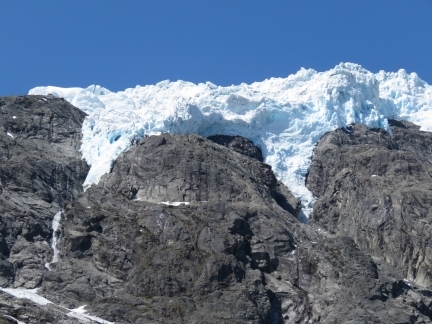 Close-up to the edge of Supphellebreen glacier. 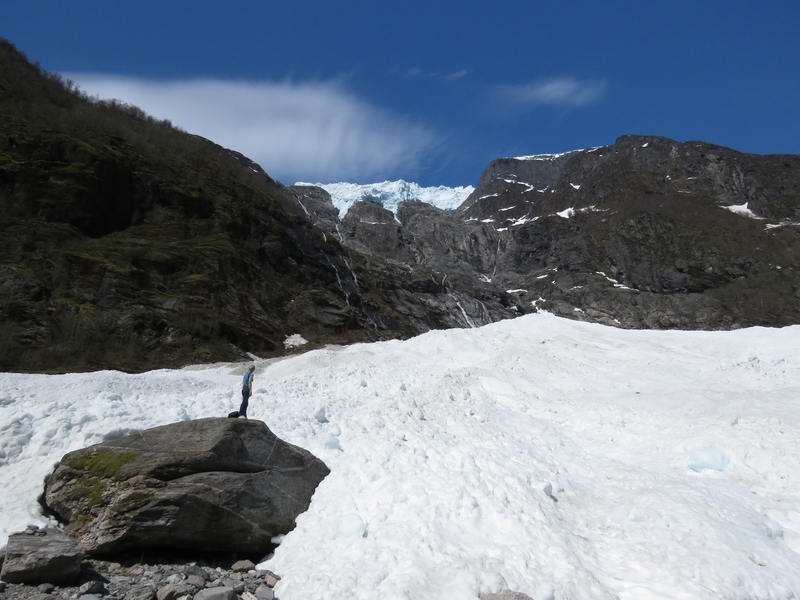 Jennifer perched on a rock outcropping under Supphellebreen glacier. 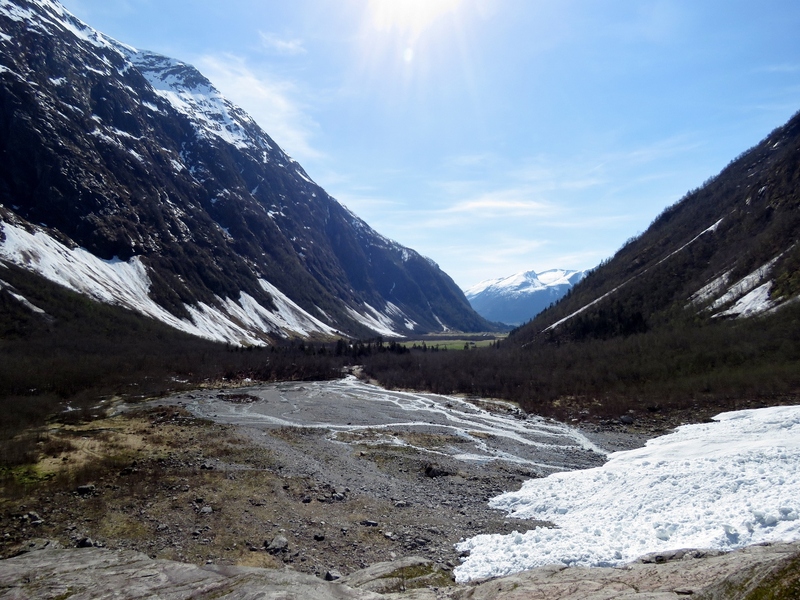 With the river below to wide to cross, we had to hike across the snow a few time to get to the other side. 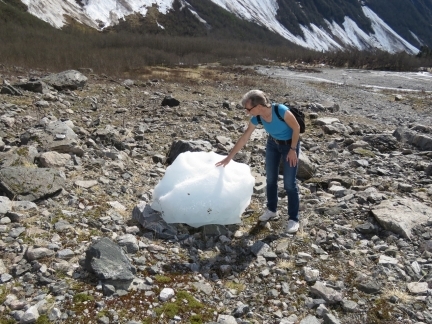 A big chunk of glacial ice from Supphellebreen glacier. 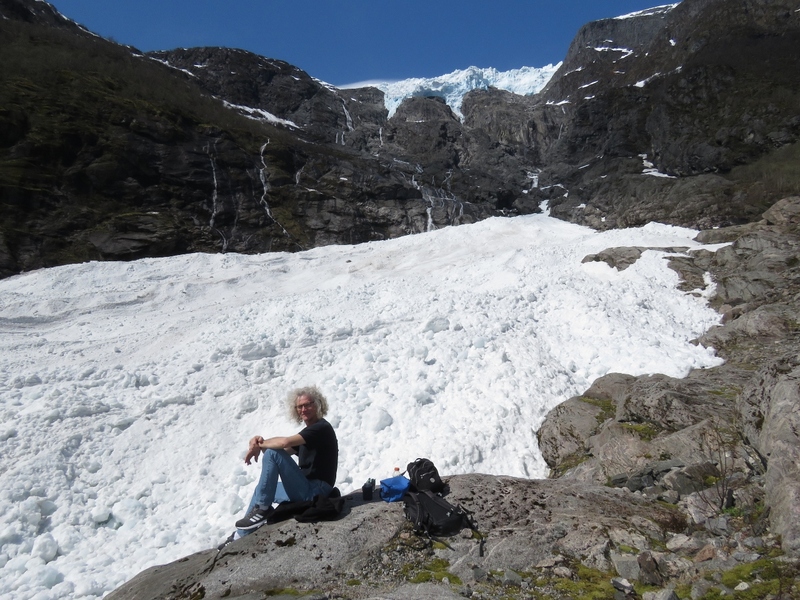 Lunch on the east side of Supphellebreen glacier. It was so warm we were just in T-shirts. Looking back across the valley we’d biked up to reach Supphellebreen glacier. 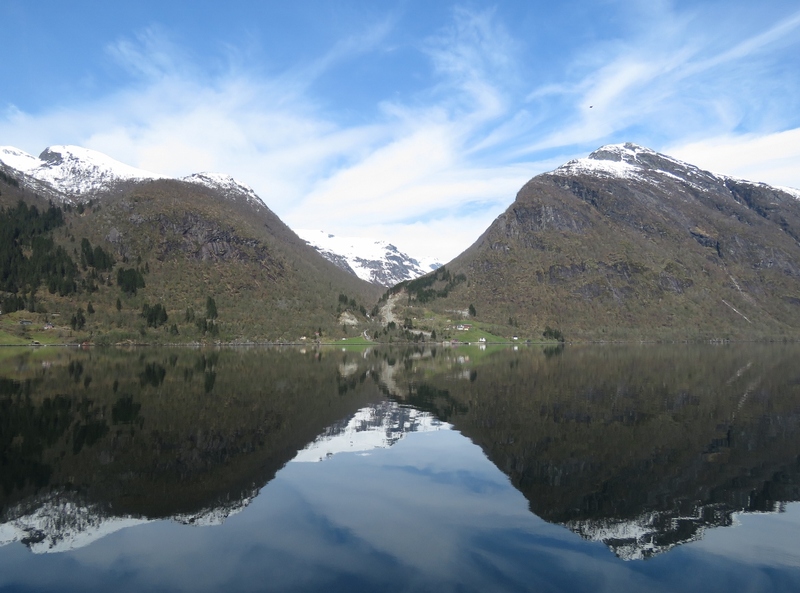 After visiting Supphellebreen glacier we returned back to Fjærland to visit the Norwegian Glacier Museum. 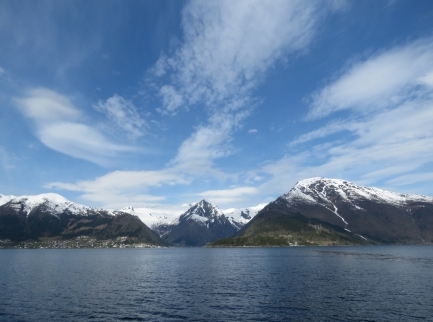 The Glacier Museum has a rooftop deck with excellent mountain views. 1000-year old glacial ice at the entrance to the Glacier Museum. Supphellebreen glacier that we visited is part of Jostedalsbreen, the largest icecap in mainland Europe. 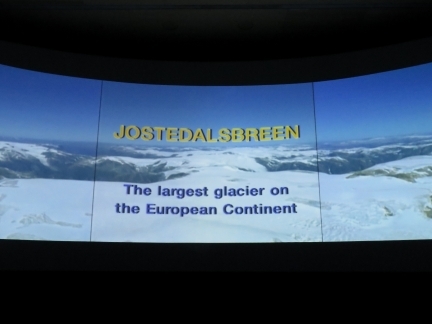 The Glacier Museum has an excellent movie describing Jostedalsbreen with impressive aerial videography. 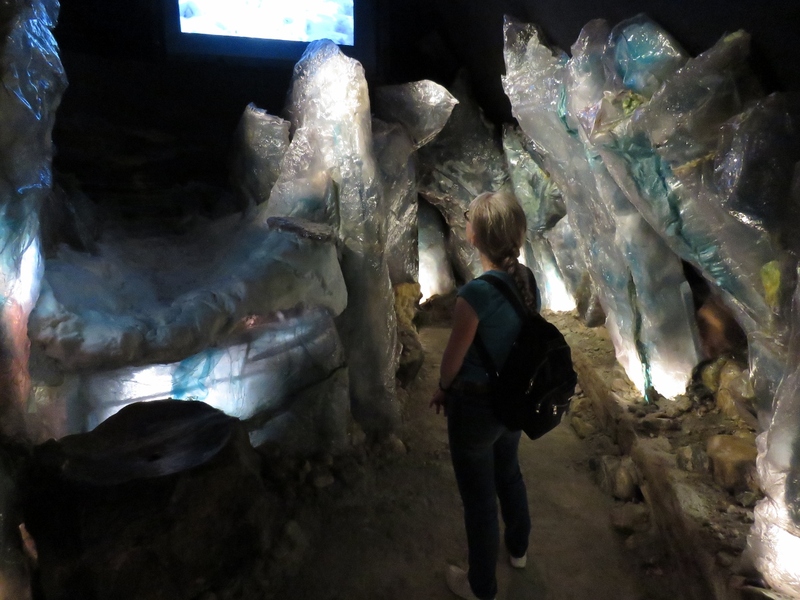 Another impressive exhibit at the Glacier Museum covered climate change through time. The museum also had a number of other interesting displays. 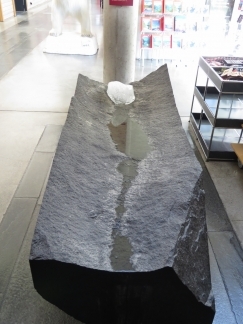 We really enjoyed our visit—this is one of the better museums we’ve seen in the last year or so. 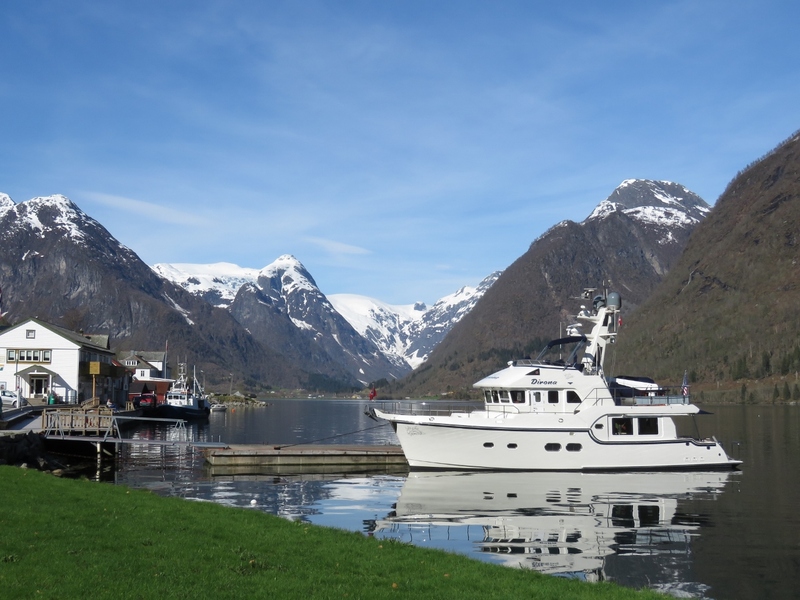 The view past the quay to the head of Fjærlandsfjord as we return back to Dirona. 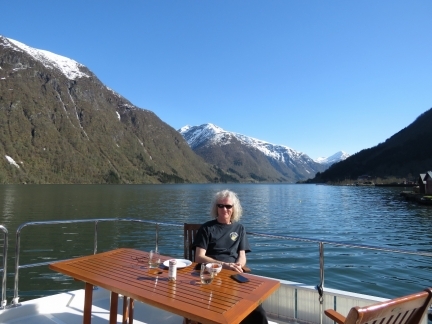 Drinks on the boat deck in the warm afternoon sun.